Sometimes we use the BU Research Blog to report on our own research and publications, sometimes post blogs about the works of colleagues. Occasionally we have the pleasure to report on something written about, or in reply to, our own studies. 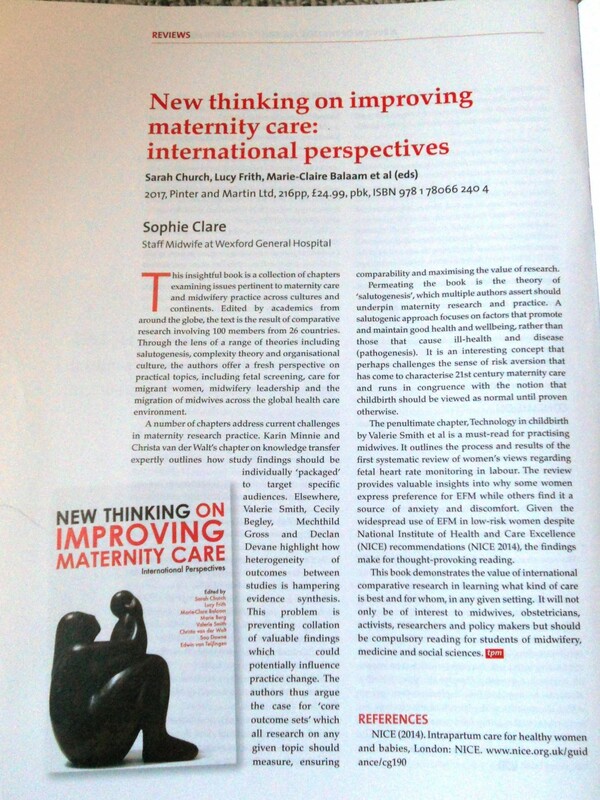 This book review in The Practising Midwife  falls in the latter category as it reviews our recently published edited volume New Thinking on Improving Maternity Care: International Perspectives. This volume is edited by academic from across the varies countries . The book is the result of years of comparative international research, funded by the EU (European Union) through its COST Action. The book sets out to generate the best possible evidence across a range of childbirth practices, contexts, and issues in Europe (and beyond). Clare, S. (2017) New Thinking on Improving Maternity Care: International Perspectives, Sarah Church, Lucy Firth, Marie-Claire Balaam et al (ads) 2017, Pinter and Martin Ltd, 216pp, £24.99, pbk, ISBN 978 178066 240 4 [book review], The Practising Midwife 20(6):36. Over 25 years ago during my PhD research comparing the organisation of midwifery and maternity care in the Netherlands and the Northeast of Scotland I wrote a chapter comparing the history of maternity care in the two countries. I needed to write this not, as I thought at the time, to improve my thesis, but for myself to help me as a sociologist to help understand these historical developments. In the process of researching the history of midwifery in the Netherlands I found a commemorative book by Drenth (1998) celebrating the centenary of the Dutch midwifery organisation. In this book is a footnote stating that the first chair of the KNOV (Royal Dutch Organisation of Midwives), Ms Francijntje de Kadt, lived and worked in the town of Vlaardingen in the late 19th to early 20th century (Drenth 1998). This note caught my eyes as I am born and bred in Vlaardingen. After a bit more searching and a visit to the archives of the town of Vlaardingen I managed to dig up a little more about Francijntje de Kadt, but not an awful lot. During a family visit to the Netherlands I visited the archives of Vlaardingen to see what information they had about her. 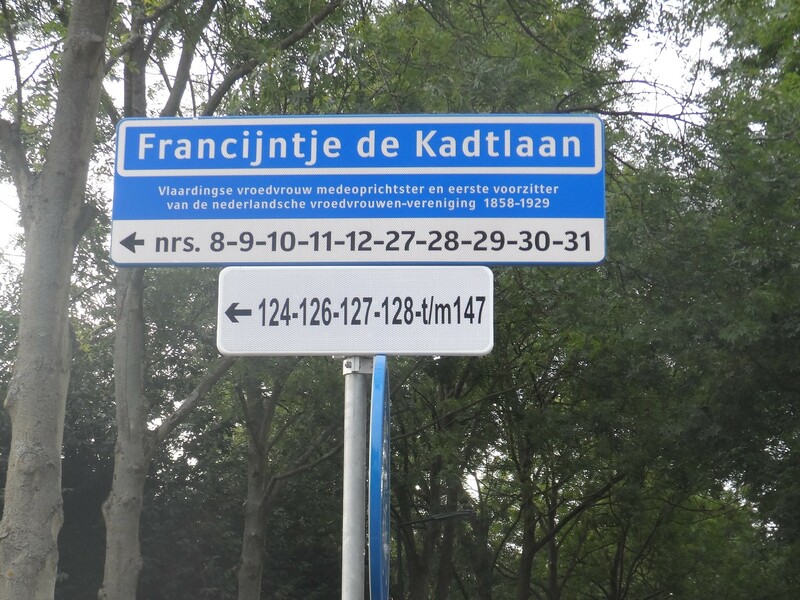 The archivist immediately recognised the name of Francijntje de Kadt, since genealogists keep finding her name as the midwife listed on their ancestors’ birth certificates. However, the archivist did not know that Francijntje de Kadt had been the first chair of the Dutch Mmidwifery organisation from its establishment in 1898 till 1926. At that point I decided to apply for a small travel grant in the History of Medicine from the Wellcome Trust. That application was successful, awarding a travel grant of £ 1,050 in 2001. My research in various archives in the Netherlands resulted in two papers (in Dutch) about Francijntje de Kadt, one in a local history journal (van Teijlingen 2003a) and one in the Dutch midwifery journal (2003b) and one about the collapse in 1921 of the midwives’ first pension fund (van Teijlingen 2002). This was for a while the end of my career as an amateur historian due to my busy day job as a health researcher and MSc coordinator at the University of Aberdeen. Many years later (2010) I ended up talking to the burgomaster of Vlaardingen at the reception organised by the town to celebrate the fact that my father had been awarded the Dutch equivalent of an OBE. Over a drink I asked the burgomaster what the process was for suggesting a new street name in Vlaardingen. 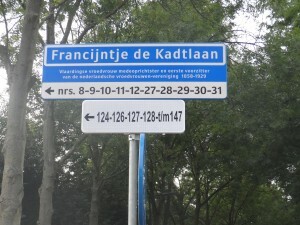 He suggested I write to the Street Name Committee with a justification why Francijntje de Kadt deserved a street name. With my recommendation I sent this committee my two Dutch publications. A few months later the secretary to the Street Name Committee wrote to say that my proposal had been accepted and that her name would be given to a street in a new development of the former local hospital grounds. Then in mid-2015 a Dutch historian Eva Moraal came to Vlaardingen with her partner on a day trip and they ended up walking through the Francijntje de Kadtlaan. She read the subscript on the street sign (see photo) and thought ‘This woman need to have an encyclopaedia entry!’ A few days later she emailed me at Bournemouth University for further information on the live, work and achievements of Francijntje de Kadt to help her write a piece for the encyclopaedia. Two months ago Eva Moraal (2015) published her very nice contribution on Francijntje de Kadt. So what started as a small historical study as an introduction chapter of a PhD thesis in Medical Sociology ended up with a ‘forgotten’ national midwifery leader having a street named after her in the town she spent most of her working live and her own entry in the encyclopaedia, Digitaal Vrouwenlexicon van Nederland (in Dutch: Online Women’s Lexicon of the Netherlands). What is even more interesting that this otherwise chronologically logical story is based on three major co-incidents: first, spotting a footnote in commemorative book about Vlaardingen. If Francijntje de Kadt had lived and worked anywhere else in the Netherlands other than my birthplace I would not have paid much attention. Secondly, speaking to the burgomaster of Vlaardingen and having a conversation in which street names cropped up, and thirdly, Eva Moraal who just happened to walk through the Francijntje de Kadtlaan, reading the street sign, and thinking this is an historical figure who needs better recognition. Drenth, P. (1998) 1898-1998. Honderd jaar vroedvrouwen verenigd, Bilthoven: KNOV. van Teijlingen, E. (2002) Ondergang eerste pensioenfonds voor vroedvrouwen (in Dutch: Decline of the first pension fund for midwives), Tijdschrift voor Verloskundigen (in Dutch: Journal for Midwives), 27(12): 684.
van Teijlingen, E.R. (2003a) Berichten – Francijntje de Kadt (1858-1929), Tijdschrift voor Verloskundigen (in Dutch: Journal for Midwives), 28(12): 630-633.
van Teijlingen, E.R. (2003b) Francijntje de Kadt (1858-1929). Vroedvrouw te Vlaardingen en eerste voorzitter van de Nederlandsche vroedvrouwenvereeniging, Tijd-schrift (in Dutch: Time-Magazine) 88: 14-23. This title was suggested by one of our collaborators Jeffery L Nicholas. Jeff is a scholar at Providence College in the USA who came to visit Bournemouth University recently. 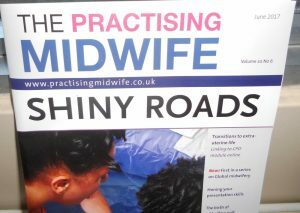 It is a great title, especially since many think about midwifery in terms of its long tradition. Some refer to midwifery as the ‘second oldest profession’. This blog post highlights some of the thinking generated through cross-national inter-disciplinary research. Jeff (philosopher) and Edwin (medical sociologist) have been discussing the kind of political challenges midwives face today: struggles around the health of the mother and child, over costs (especially the underfunding of the NHS) and providers, and over the rights of women and families to choose. We both believe strongly that these struggles are inter-connected, and Jeff thinks a new approach is worthy of investigating for possible theoretical and practical aid in these struggles. Specifically, Jeff looks at midwifery as a particular kind of practice with revolutionary potential. This question emerges from the work of Alasdair MacIntyre (1929—). MacIntyre condemns the bureaucratic society in which people become manipulators and manipulated. He also rejects large-scale, nation-state politics by which citizens might wrest control of their lives from those in charge. Rather, he focuses on the every day activities that comprise most of our lives. These activities—practices—come with their own ends that participants attempt to achieve, and they help teach individuals the virtues they need to act as agents in their lives, to participate in their communities, and to flourish. A strong community based around practices is one in which all can pursue the good life together, even if threatened by the state. We hope these questions interest others, and that, together, we might pursue avenues of research to help us understand midwifery in the wider society, to support midwives and communities of midwives, to support human beings in their every day lives, and to birth a better world. 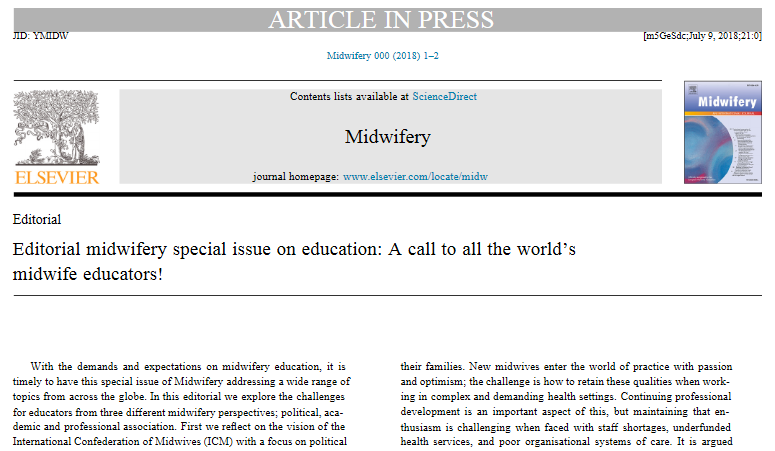 It is also in the top 12 most quoted papers published in Midwifery. This interesting as all 11 papers that have been cited more often are older, i.e. have been in print longer and therefore had more time to be cited. Background: there is an on-going debate about perceptions of risk and risk management in maternity care. Objectives: to provide a critical analysis of the risk concept, its development in modern society in general and UK maternity services in particular. 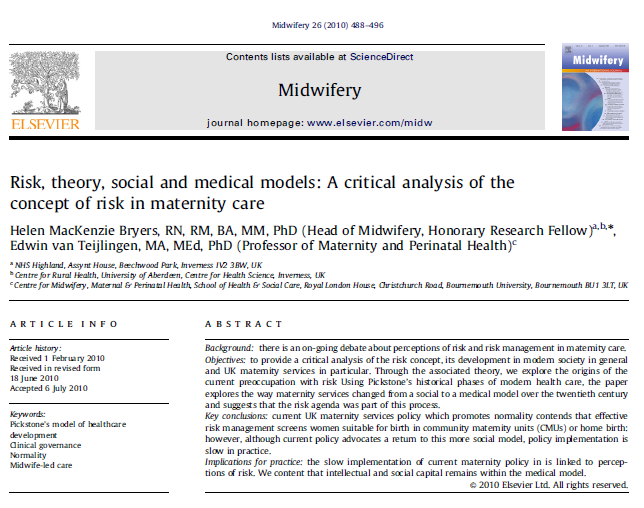 Through the associated theory, we explore the origins of the current preoccupation with risk Using Pickstone’s historical phases of modern health care, the paper explores the way maternity services changed from a social to a medical model over the twentieth century and suggests that the risk agenda was part of this process. Key conclusions: current UK maternity services policy which promotes normality contends that effective risk management screens women suitable for birth in community maternity units (CMUs) or home birth: however, although current policy advocates a return to this more social model, policy implementation is slow in practice. Implications for practice: the slow implementation of current maternity policy in is linked to perceptions of risk. We content that intellectual and social capital remains within the medical model. © 2010 Elsevier Ltd. 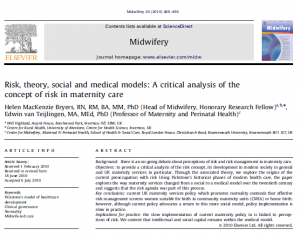 The full reference this paper is MacKenzie Bryers, H. & van Teijlingen, E. (2010) Risk, theory, social and medical models: A critical analysis of the concept of risk in maternity care. Midwifery 26(5): 488-496.